JANUARY SALES? : Sean Dyche is weighing up his options as the January transfer window looms. Burnley boss Sean Dyche believes that his players have given him food for thought when it comes to bolstering the squad in the New Year. With just seven games remaining until January’s transfer window opens, thoughts will soon turn to signings in the club’s bid to push away from the Premier League’s drop zone over the second half of the season. The Clarets have climbed off the foot of the table following consecutive wins over Hull City at Turf Moor and Stoke City at the Britannia Stadium. And it’s the character shown in those performances in particular that has significantly narrowed Dyche’s target market. The North West Championship Manager of the Year, who beat off competition from Manchester City’s Manuel Pellegrini and Liverpool’s Brendan Rodgers, insists that it’ll be a tough task to find the appropriate personnel to rival his players in current form. 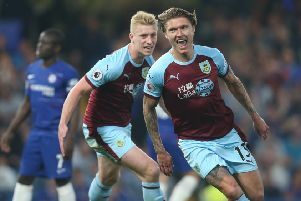 Dyche, who has seen the club widen the net with the additions of UK and International Scout Robbie Cooke and Technical Scout Ben Mackriell, said: “There are extreme trains of thought, ‘why are they spending, why are they not spending?’ If you do, you’re ruining the club, but I believe in what we do and how we operate. “We know the challenge, we know there’s a market beyond us in this division - it doesn’t mean we can’t win by the way - but there is a market we can compete in, and I think we are.